The rotator cuff is a unique structure in the shoulder that is formed by four tendons. These four tendons attach to four muscles that help keep the shoulder stabilized in the socket (or glenoid) and help rotate the upper arm inward and outward. If the rotator cuff is torn and is not repaired, a type of wear and tear arthritis of the shoulder can develop over time. This condition is sometimes called arthropathy and the term cuff tear arthropathy is used to describe this type of arthritis of the shoulder that develops when the rotator cuff is damaged. If you develop this condition, your shoulder will be painful. Movement and strength of the shoulder will be decreased. Moving the arm away from the body and raising it over your head can be especially difficult. What parts of the shoulder are involved? The bones of the shoulder are the humerus (the upper arm bone), the scapula (the shoulder blade), and the clavicle (the collar bone). The roof of the shoulder is formed by a part of the scapula called the acromion. The shoulder joint is also called the glenohumeral joint. One of the bones of the glenohumeral joint is the humerus (the long bone of the upper arm). It has a ball, called the humeral head on the top end. The humeral head fits into a small, shallow cup called the glenoid fossa. It makes up the other part of the glenohumeral joint. The glenoid fossa is part of the shoulder blade. 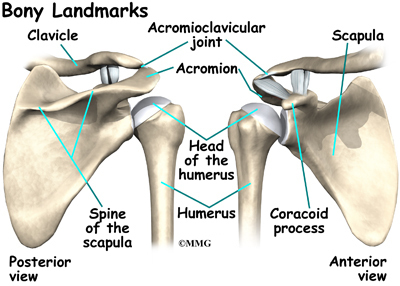 A large ligament runs from the front of the acromion to another part of the shoulder blade called the coracoid process. This ligament is called the coracoacromial ligament. It adds stability to the front of the shoulder. The rotator cuff is made up of tough, fibrous tissue. It forms a cuff (or capsule) covering the shoulder joint. There are four tendons that help form the rotator cuff. The muscles that form the tendons are the supraspinatus, infraspinatus, teres minor, and subscapularis. These muscles rotate the shoulder outward and inward. Along with another muscle, the deltoid, they also help lift the arm away from the body. The rotator cuff slides between the humeral head and the acromion as we raise our arm. As this sliding occurs over and over, the rotator cuff tendons will often be pinched as you use the shoulder everyday. This pinching is called impingement. Over time this pinching can lead to damage and weakening of the rotator cuff tendons. Dr. Charles Neer actually described rotator cuff tear arthropathy (RCTA) in 1977. Today, doctors generally refer to this as simply cuff tear arthropathy. Cuff tear arthropathy is actually a type of wear and tear, or degenerative arthritis of the shoulder that develops over time after the rotator cuff is damaged. Normally, when the rotator cuff muscles contract, they pull the head of the humerus tightly into the socket of the shoulder. This stabilizes the shoulder and allows the the large deltoid muscle to raise the arm over the head as it rotates the humeral head like a pulley. This motion needs the rotator cuff and deltoid muscles to work together - in balance. When the rotator cuff is torn, the shoulder becomes unbalanced. The deltoid muscle pulls the head of the humerus up into the acromion in a sliding motion. When the top of the humerus hits the underside of the acromion, the deltoid may be able to pull the arm part way up as it levers against the underside of the acromion. But, over time this abnormal sliding motion causes wear and tear on the joint surfaces. Arthritis develops and any motion becomes painful. The shoulder becomes weaker and weaker until you can no longer raise the arm above the head. Rotator cuff tears are very common. Trauma, such as falls, lifting, and pulling forcefully can also cause a rotator cuff tear. When this happens, it is called an acute tear. Although the rotator cuff can be damaged from a single traumatic injury, damage to the rotator cuff usually occurs gradually. Age can be a factor. As we age, the tendons of the rotator cuff become weaker and more likely to be injured. The blood supply to the tendons diminishes with age. 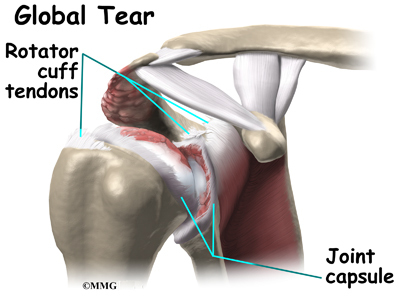 Rotator cuff tears are much more likely to occur after the age of 40. Certain activities can increase the wear and tear on the rotator cuff. Repetitive overhead activity such as painting, plastering, racquetball, weightlifting, and swimming can cause wear and tear of the rotator cuff. Surgeons generally will recommend surgery to repair a rotator cuff tear when it occurs. A successful surgical repair of a torn rotator cuff tear can make the development of cuff tear arthropathy much less likely. But, sometimes a rotator cuff tear cannot be repaired. The tissue is simply too damaged and cannot fixed. This is not an uncommon situation in older patients with rotator cuff tears. In other cases, the patient simply elects not to have surgery to repair a rotator cuff tear and chooses to simply live with the discomfort. Over several years, both of these situations can result in the later development of rotator cuff arthropathy. The most common symptom of rotator cuff tear arthropathy is pain in and around the shoulder. The pain can also radiate into your neck, arm, even into your wrist or hand. The shoulder can be especially painful when trying to lift the arm, or rotate it outward. The pain is usually worse at night. It can interrupt your sleep, especially if you try to sleep on the affected shoulder. If untreated, the pain can be nearly continuous and can be severe. Weakness of the shoulder makes it difficult, if not impossible to lift the arm overhead. Often, even starting this motion can be difficult. The tendency is to shrug the shoulder in order to lift the arm part of the way. With time, weakness of the rotator cuff muscles will worsen. Range of motion can be quite limited. You will often find it difficult to do routine things, like reaching behind your back, reaching into a cabinet, or combing your hair. You may notice a crackling or popping sensation. 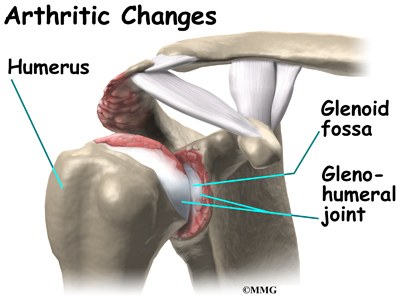 When there is arthritis of the glenohumeral joint, there is often a creaking or grating sound. Your doctor will want to do a history and physical examination. He will ask you about activities or trauma that could have injured your shoulder. He will want to know the level of your pain, and what limitations you have. A physical examination is done. Range of motion and strength of the shoulder muscles will be evaluated. Your doctor will want to look at your shoulder to see if there is bony deformity, or atrophy (shrinkage) of the muscles. With a complete rotator cuff tear, moving the arm away from the body can be nearly impossible. 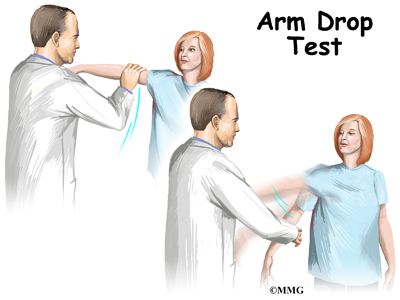 If your doctor lifts your arm for you, and you cannot hold it up, this is called a positive Drop Arm Test. This usually means the rotator cuff is torn. Other areas such as the neck may also need evaluation. A pinched nerve in the neck can mimic a rotator cuff tear. A neurological examination to include checking reflexes and sensation may be included. Your doctor may want you to have an electromyogram (EMG). This checks the function of the muscles of the shoulder. An EMG uses a small needle in the muscle being tested. It measures the electrical activity of the muscle at rest, and when tightened. Your doctor will request X-rays of your shoulder. X-rays show the shape of the bones and joints. When the rotator cuff is torn, the shoulder will often ride high, meaning that it sits higher in the joint than it should. It can also show how much damage ahs occurred to the joint surfaces. Magnetic resonance imaging (MRI) allows your doctor to look at slices of the area in question. The MRI machine uses magnetic waves, not X-rays to show the muscle, tendons, and ligaments of the shoulder. MRIs will show tears of the rotator cuff tendons. Atrophy of the muscles can also be evaluated with MRI. A computerized tomography (CT) scan shows slices of bone. Like X-rays, it uses radiation. A CT scan can help to more accurately determine the degree of damage of the glenohumeral joint. A CT scan is especially useful to plan surgery if an artificial shoulder replacement is considered for treatment. Conservative care that includes physical therapy, ice, heat, and anti-inflammatories is tried first. The goal of treatment is to reduce pain, and increase range of motion and function. Corticosteroid injection into the shoulder joint is also sometimes helpful. Steroids are very powerful anti-inflammatory medications that can reduce pain temporarily. These injections will not heal the tear but may give pain relief for several weeks to months. If arthritis of the shoulder is advanced, and pain is continuous and severe, surgery may be the best option available. 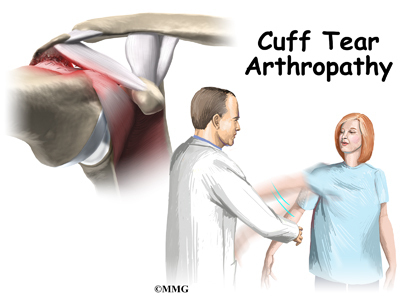 Cuff tear arthropathy is the result of long standing lack of rotator cuff function. In almost all cases, repair of the rotator cuff tear is no longer an option. Surgery for cuff tear arthropathy is done when pain and decreased motion continue after conservative care. The simplest surgical procedure to try and improve the situation is a debridement. During a debridement, the surgeon will surgically remove (debride) any inflammed tissue, bones spurs and loose flaps of tendon tissue that may be catching in the joint and causing pain. This procedure may reduce pain, however, it does not always improve range of motion, strength, or function of the shoulder. Patients with this type of arthritis would seem to be good candidates for a shoulder replacement, but replacing the shoulder in the typical fashion has not been successful. Replacing the shoulder with a special type of artficial shoulder joint is becoming more popular. 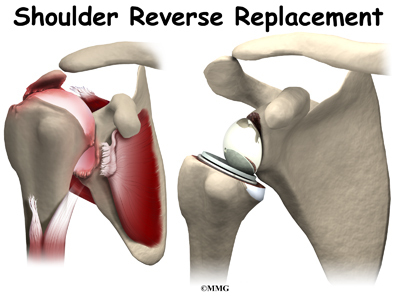 This procedure is called a reverse shoulder replacement. The "normal" artificial shoulder was designed to copy our real shoulder. The glenoid component (the socket) was designed to replace our normal shoulder socket with a thin, shallow plastic cup. The humeral head component was designed to replace the ball of the humerus with a metal ball that sits on top of the glenoid. This situation has been compared to placing a ball on a shallow saucer. Without something to hold it in place, the metal ball simply slides around on the saucer. In the shoulder that something is the rotator cuff and the muscles that attach to the tendons. Without a rotator cuff to hold the metal ball centered in the plastic socket, the metal quickly wore out the plastic socket and the joint became painful once again. The answer to this dilemma was to rethink the mechanics of the shoulder joint and design an artificial shoulder that worked differently than the real shoulder joint. The solution was to reverse the socket and the ball, placing the ball portion of the shoulder where the socket use to be and the socket where the ball or humeral head use to be. This new design led to a much more stable shoulder joint that could function without a rotator cuff. The artificial joint itself provided more stability by creating a deeper socket that prevented the ball from sliding up and down as the shoulder was raised. The large deltoid muscle that covers the shoulder could be used to more effectively lift the arm, providing better function of the shoulder. The final result is a shoulder that functions better, is less painful and can last for years without loosening. Your physical therapist will show you how to use ice or heat to help with pain. You will also be instructed in exercises to strengthen your shoulder girdle as much as possible. Showing you joint protection tips, or motion that you can expect to do safely without causing more harm to your shoulder is also important. The goal is to reduce pain, increase range of motion and function, and prevent further arthritis. A physical or occupational therapist will see you the day after surgery to begin your rehabilitation program. Therapy treatments will gradually improve the movement in your shoulder. Your therapist will go over your exercises and make sure you are safe getting in and out of bed and moving about in your room. Out patient therapy at a facility can often more effective and is often preferred over home physical therapy. The first few outpatient treatments will focus on controlling pain and swelling. Ice and electrical stimulation treatments may help. Your therapist may also use massage and other types of hands-on treatments to ease muscle spasm and pain. Continue to use your shoulder sling as prescribed. As the rehabilitation program evolves, more challenging exercises are chosen to safely advance the shoulder's strength and function. Finally, a select group of exercises can be used to simulate day-to-day activities, like grooming your hair or getting dressed.